Adjustable Mouth? Open or Closed Throat? Say what? What’s all the ruckus about adjustable mouth planes? What are they? Do I need one? How do I use it? 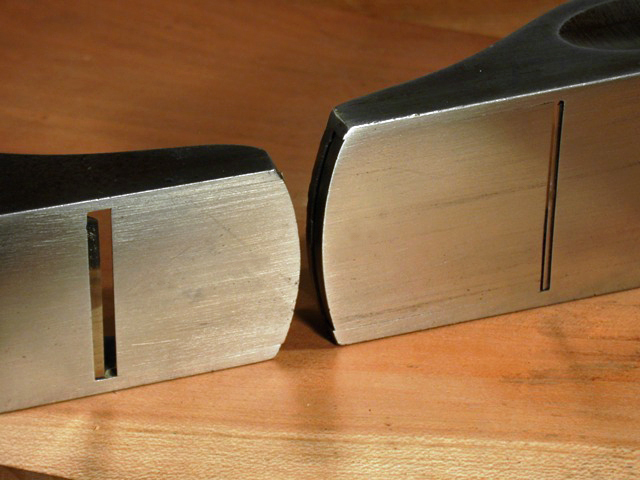 What’s the difference between adjustable throat planes and adjustable mouth planes? Good grief, it’s enough to give any new galoot a headache! Stanley no. 60 with mouth open on left; Stanley no. 18 with mouth closed on right. What’s the difference? To clear up the confusion, let’s start with the nomenclature. Both ‘adjustable throat’ and ‘adjustable mouth’ actually refer to the same feature. Both terms are used interchangeably, which is confusing and in my opinion, technically incorrect. The mouth is the rectangular opening that you see when looking at the bottom of the plane. The throat is the area above the mouth on the top side of the plane. The part that is adjustable is the mouth, not the throat. That said, even Stanley wasn’t consistent in its terminology, listing ‘adjustable throat‘ planes in their catalogs some years and ‘adjustable mouth‘ planes other years. Far be it from me to argue the point one way or the other, but for the rest of this post, I’m sticking with adjustable mouth. What is it? An adjustable mouth on a plane means that the size of the mouth opening can be adjusted, i.e., opened to make it larger or closed to make it smaller. Typically, this is accomplished by sliding the toe section of the plane forward (away from the iron) to increase the size of the mouth opening, or backward toward the iron to decrease it. Not all planes have adjustable mouths. In the world of vintage tools, adjustable mouths were most commonly featured on the various manufacturers’ premium lines of block planes and a few of their specialty planes. Modern manufacturers like Lie Nielsen and Veritas understand the value of adjustable mouths to woodworkers and feature them on many of their bench planes as well their block planes. Why do I need it? The value of having an adjustable mouth on a plane is the ability to increase or reduce the space between the leading edge of the mouth opening and the cutting edge of iron. If you’re making a heavy cut and taking thicker shavings, you want more open space in front of the iron for the shaving to pass. If you’re making a fine cut, taking thin shavings, you need less space in front of the iron. In fact, you want the opening to be just marginally larger than the thickness of the shaving. How do I use it? In practice, the leading edge of the mouth presses down on the wood fibers as you make a cut. Having a ‘fine set’ to your plane (meaning a closed mouth and very shallow depth of cut) keeps the wood in front of the iron tightly compressed. This enables a very thin shaving with less chance of tear out, in which the wood fibers split well ahead of and below the cut. Opening the mouth accomplishes just the opposite. With less compression, the iron is able to take a thicker cut, and the larger opening allows the shaving to pass through unobstructed up into the throat area. Naturally, the size of the mouth opening is only half of the equation – you also need to decide how far down to extend the iron based on how deep you want to cut. If you try to take a heavy a cut with the mouth too tightly closed, the shaving will be too thick to pass through the opening and will quickly clog the mouth opening or simply come to a screeching halt. This effect can be more or less pronounced depending on the type of wood you are working on. The trick, of course, is finding the right balance between set of the iron and opening of the mouth, but this is truly not as difficult as it might sound. A little trial and error will quickly build experience and give you a ‘feel’ for how to set your plane for the cut you desire. Once you have it set appropriately for what you’re trying to accomplish, the results will be superior to what you would get from a plane with a fixed aperture mouth, which lacks the flexibility for making fine adjustments to the cut. As a final thought, it is worth pointing out that many planes without adjustable mouths can still be adjusted. Virtually all bench planes have adjustable frogs. Moving the frog forward or backward decreases or increases the size of the mouth opening, accomplishing the same goal as an adjustable mouth, even if the process is a little more involved. Still, that is precisely why Stanley added the frog adjustment feature to their planes in 1907. Unlike bench planes, the frogs of block planes are fixed, so unless they have an adjustable mouth, you’re stuck with the fixed size opening. This is why adjustable mouth block planes are more highly regarded and valued by woodworkers. * This is not a complete list, but includes the most common planes for use. For more information on plane nomenclature, please refer to the Plane Terminology page for a full dictionary of plane parts and terms. Great information for me since I am relatively new to collecting tools.